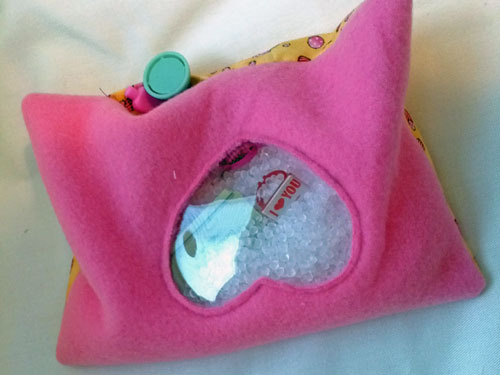 Keep the kids busy for hours with these portable eye spy bags. 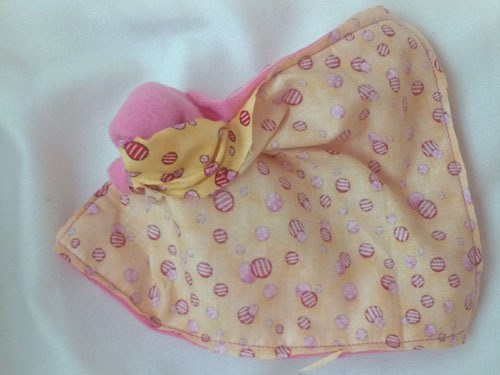 Perfect for little or big hands, this toy can be taken just about everywhere – in the car, waiting rooms, or even restaurants. 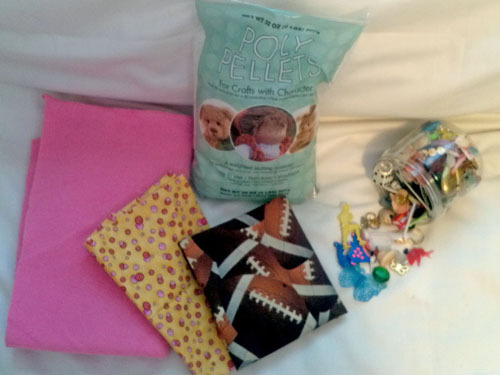 * Fairfield Poly-Pellets can generally be found in craft and hobby stores in the batting/stuffing aisle. If desired, Poly-Pellets can be replaced with rice or seeds. 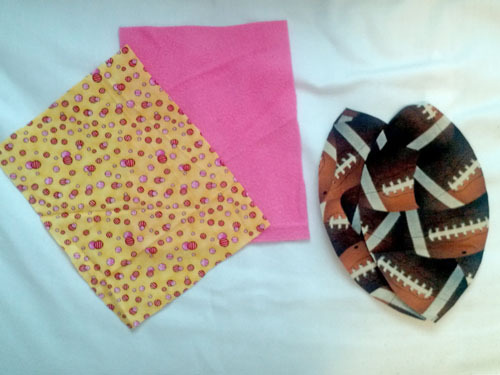 Step 1) Prepare the fabric. Download the Eye Spy Bags file and print the templates. 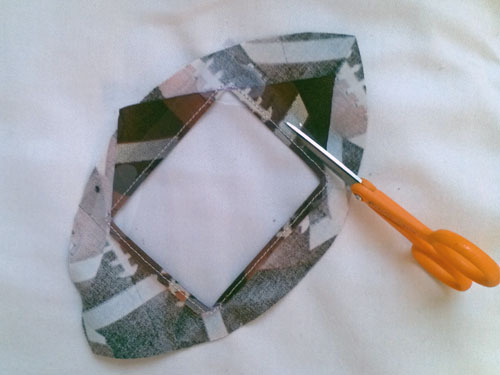 Cut two 6-1/2ʺ x 8-1/2ʺ rectangles of fabric. 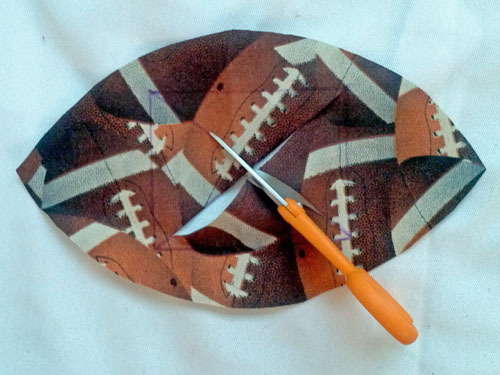 Download the template and use the football-shaped piece as a guide to cut two pieces of fabric. Step 2) Create the viewing window. 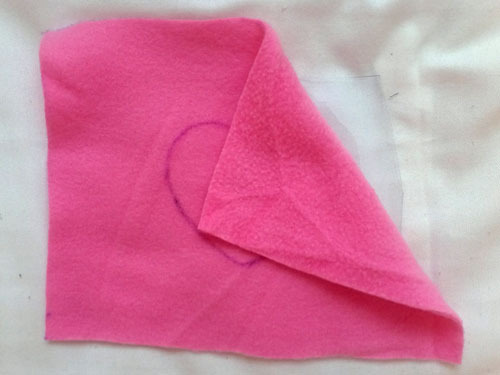 Fleece doesn’t ravel, so it’s not necessary to fold back the raw edges of the opening. Consequently, any shape can be used for the viewing window (heart, circle, star, etc.). 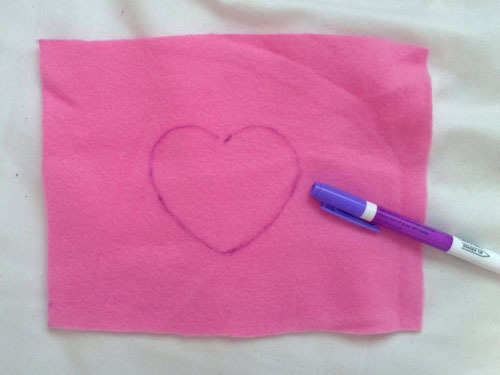 Trace the desired shape onto the right side of the fleece using a water-soluble marker. Do NOT remove the shape. 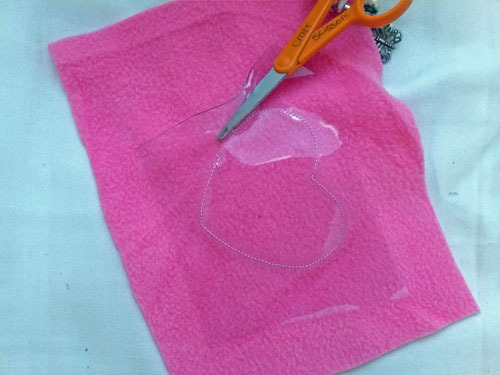 Place the clear vinyl square under the traced area and pin it in place. Keep pins outside the area that will be exposed in the viewing window, as they will leave permanent holes in the vinyl. Sew around the traced shape made on the fleece fabric, sewing through the fleece and the vinyl. Tip: Use a foot with a marked center line between the toes. 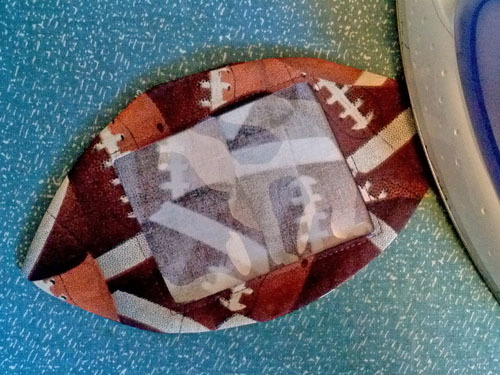 If necessary, trim the excess vinyl from the back of the fleece, around the stitched shape. 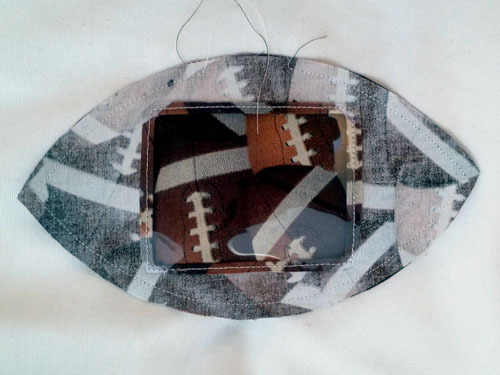 Cutting from the front, carefully trim around the inside of the stitched shape, through the fleece only, leaving a scant 1/8ʺ edge. Be careful not to cut into the vinyl or the stitching. 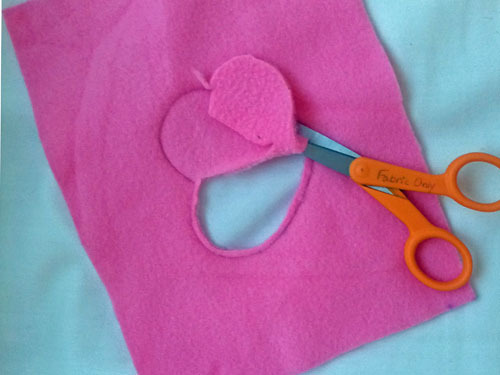 Tip: This is a perfect place to use curved applique scissors if you have them. Woven fabrics ravel, so it is necessary to finish the edges around the viewing area. Using a water-soluble marker, draw a 2-1/2ʺ x 3-1/2ʺ rectangle on the right side of one fabric rectangle as shown on the pattern piece. Draw an X inside the rectangle, connecting the corners. Do NOT remove the rectangle. Cut along the diagonal lines of the X. Do NOT remove the fabric from inside the X. 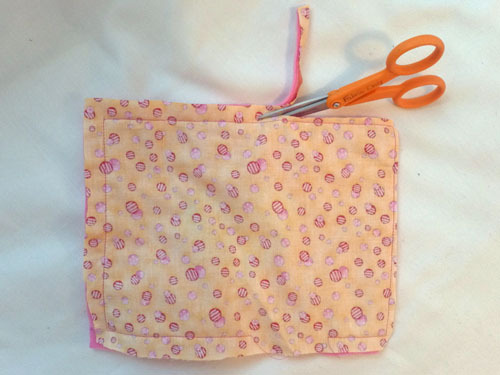 Fold each flap under to the wrong side of the fabric. Press. 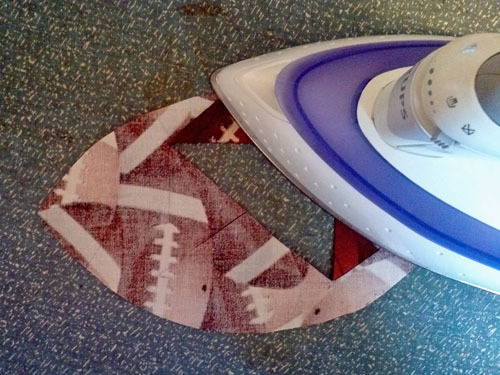 Tip: To avoid distortion, lift and press rather than sliding the iron side to side. Center the clear vinyl rectangle under the opening. Topstitch ⅛” away from the folded edges. 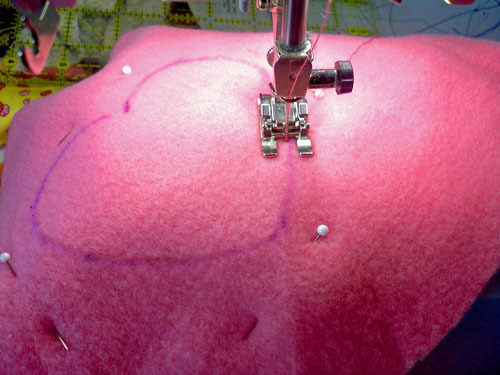 Tip: Use an edgestitch foot and adjust the needle position to the side. 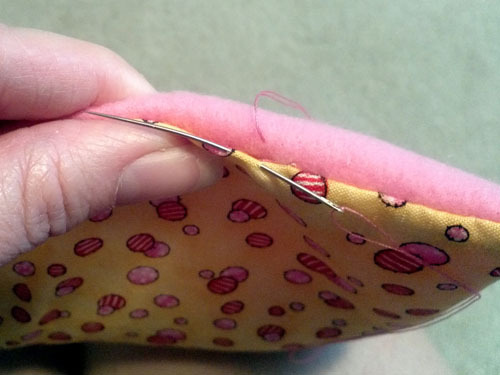 Trim the excess material from the underside of the opening, about 1/8ʺ from the stitching. Step 3) Construct the bag. 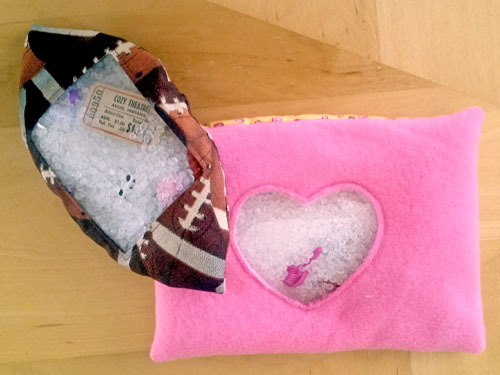 Sew around all sides of the bag using a 1/4ʺ -wide seam allowance, leaving a 2ʺ -3ʺ opening for turning and stuffing. 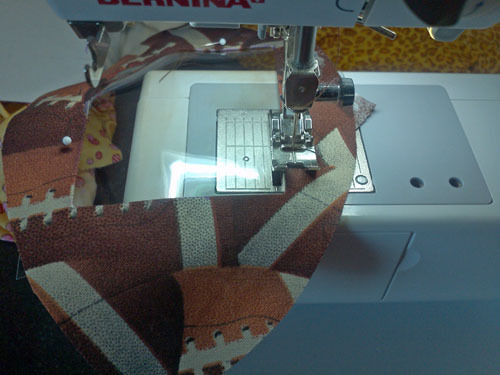 If necessary, trim the seam allowances and clip the corners. Turn right side out and press, taking care not to touch the vinyl with the hot iron. Stuff the bag with 1 to 2 cups of Poly-Pellets. The football takes approximately ¾ cup, while the rectangle needs about 2 cups. Do not stuff the bag too firmly, as this will keep the objects in the bag from moving around. Insert several small trinkets into the pellets. 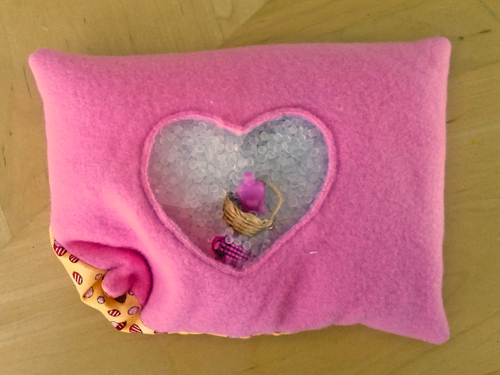 Using a hand-sewing needle and thread, stitch the opening closed. 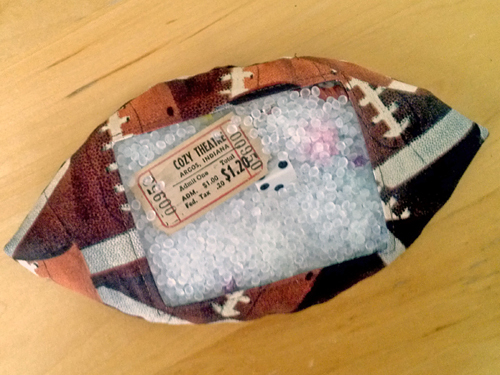 Tip: Since this toy contains small objects, it is not recommended for children under 3 years old. Tip: For younger children, use larger objects that are easier to spot. 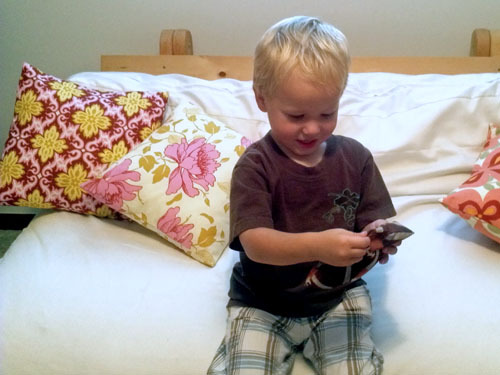 Use smaller trinkets for older children — they‘re more willing to hunt longer! Tip: For children who can read, use a printable fabric sheet to print a list of the items inside the bag. 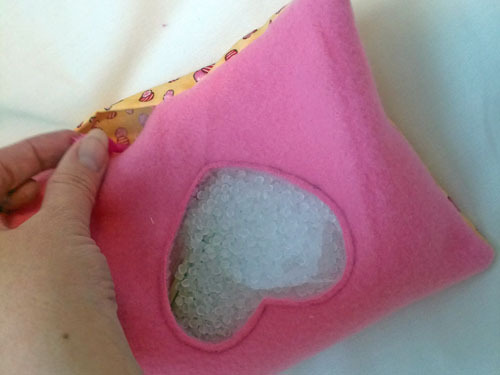 Sew the list to the back of the bag. 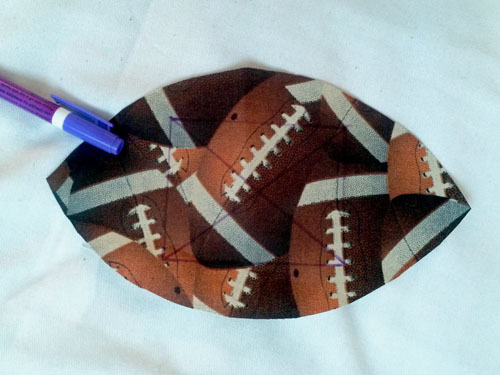 Tip: Instead of using the football template or a rectangle, use a pattern for a small 2-D plush toy.